Stories of Success: Norcal Lumber Company, Inc. The Credit Junction is proud to work with great businesses across the country. Hear from Wayne Withers, CEO of NorCal Lumber Company, Inc., to learn about how the company has grown since he acquired it, and how The Credit Junction has helped along the way. Click here to hear the full audio of the interview. About Norcal Lumber Company, Inc. 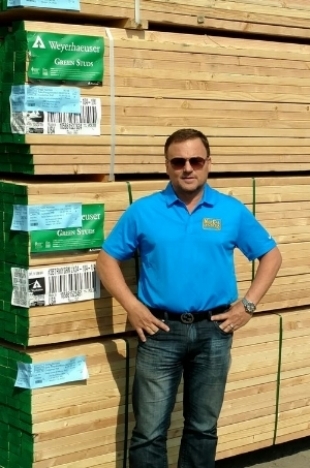 Originally founded in 1987, Wayne Withers acquired NorCal Lumber Company, Inc. in August of 2015 and has grown the company to a $40M revenue business. NorCal Lumber Company, Inc. brings decades of experience to the framing construction needs of its customers. They are specialized in a wide variety of lumber products, ranging from engineered wood to structural hardware. TCJ: Tell us a bit about NorCal Lumber Company, Inc. and the products and services you offer to your clients. WW: I have been in the industry for about 40 years. I spent 25 years with one organization in Northern California and during that tenure I was involved in growing the sales from $6M a year to $500M. 16 of the 25 years, I was the President of the organization. I left that organization in 2005 and went to work for a publicly-traded company with a national footprint. It was a $3.2Bn/year company with 33,000 employees. It was a very exciting company, it was a new experience for me. I spent 9 years with them. That was a very strenuous time, because as we all know the timeframe between 2005 and 2014, the economy went through some tremendous turmoil. The company went from $3.2Bn in 2005 to $685M by 2010. In building the business back up in 2010 when we came out of bankruptcy, I went out and hired my former employer’s employees and built out a multi-family framing division at BMC. I ran that business from 2010 to 2014 on a separate P&L and a separate business unit inside of the Northern California operations. During that time period, we completed 17 projects on the framing for about $72M in revenue. I decided to resign in September of 2014, and the organization allowed me to take that entire division with me because they had no one to run it. I started West Coast Framing, Inc. in November of 2014, and basically went in to business for myself. By August of 2015, the framing company was cash flowing well enough and I decided to get back into the lumber distribution business that I had been in my whole life. There was a vacant facility sitting in Marysville called NorCal Lumber Company, Inc. I knew the owners through the industry, but I had never met them. I called them out of the blue and met them for lunch. We discussed the opportunity of either partnering with them or acquiring the facility from them, and within 60 days we had an agreement and I had the keys to the gate. We started putting lumber in the yard and started the business in September 2015 and immediately started taking over the distribution for the ongoing West Coast Framing, Inc. jobs as we positioned ourselves to re-emerge in the marketplace as one of the leading suppliers in production residential framing. That’s what we have been doing since 2015. We have grown the sales to in excess of $40M by the end of 2017 out of the NorCal Lumber Company, Inc. facility. TCJ: If I recall, we had started talking in May of 2016. I think you were right around an $8M or so run rate. That's quite the growth in a short period of time. WW: Yeah, for sure. And I had taken the company as far as I was able to take it on my own without some additional capital availability. I was introduced to The Credit Junction and we had some conversations and talked back and forth and it looked like a good fit. Jim [Chief Credit Officer] and Rich [SVP, Credit] came out and we walked the facility and I told them my story and they said they would like to look at potentially being a capital source for what we were doing by lending against inventory and receivables. That was a game changer, because it allowed me to really start growing the business to the capacity we are at currently. It has been a great relationship. The relationship with The Credit Junction is one the reasons I’m able to do the current volume we are doing. We are really looking at what it looks like moving forward and continuing to manage the relationship. It has been a great run so far. TCJ: Sounds like a 5-fold growth in sales since we began our relationship. WW: Yes. [Laughs] We have made a splash in the marketplace. The market in Northern California was ready for another supplier, and I didn’t want anybody else to beat me to the punch. It was critical that we had a foothold and established a base of business. We were able to step in and really start making an impact early in 2016 to be one of the A-players in the Northern California market space. Hopefully that has caused a little bit of pause for some of the other guys looking to come back in and capitalize on a very strong market. I wouldn’t have been able to do it without relationships across the board. Obviously, relationships on the credit facility side, but also relationships with the vendors, customers and relationships with the employees. I have 20 people working for me today that have been with me over 15 years. A lot of them close to 25 years. It has been a phenomenal process, but it has also been very humbling. Having people willing to leave their jobs and the security of the companies that they have worked for for years and follow me into the unknown comes with a lot of responsibility. They have left their old companies behind and decided to venture a new one with me. It’s pretty exciting. TCJ: It is a great story. When we first started talking, what were you looking for in a finance partner? WW: We were looking for somebody to initially come in and loan against inventory and receivables. But to be more of a partner on the business side and really understand what we are doing. Not just be a banking transaction. I wanted somebody to understand the business we are in, understand the business model, and validate my story. The Credit Junction was able to do that. Jim [Chief Credit Officer at The Credit Junction} and Rich [Senior Vice President of Credit at The Credit Junction] came in and they realized I was very passionate about what I was doing – I think they saw the relationship I had with the employees that were with me at the time, and I was just looking for a financial lender that could also be a partner in the business that was willing to work with me and get me through the hotspots. It has been a great relationship so far. TCJ: We had started our discussions and you were also doing your own due diligence on your end. How did you approach that side of things? WW: There’s 2 or 3 banks I was dealing with, and am still dealing with, but getting through a traditional bank committee as a brand-new business even though my reputation was strong and my business model was strong and they knew of me… without a couple of years under your belt as a new business, it is very tough to go out and get a traditional bank loan. The Credit Junction was a great fit, and I felt very comfortable with the relationship early on once I met Jim and Rich. TCJ: It definitely seems like one of the things that financing at that time helped solve was helping the company to scale. Is that primarily what The Credit Junction’s solution provided for you? Is there anything else financing has provided you with over the last year and a half? WW: It was all about the ability to scale. We talked about that from the very beginning. I couldn’t scale without a credit facility. It has been a steady growth. We set the line at a high enough level that allowed me to scale to where I’m at. There’s been some good accounting advice, too. The reporting process, even though it’s a pretty easy process, it was a new process for me. It had a learning curve. The other thing that The Credit Junction provided was the patience with that learning curve and helping me work through the system so that we could handle the reporting structure. It has gone pretty smoothly, I think. The spirit of cooperation between both companies has always been there, and it has been appreciated on this end for sure. Wayne Withers, CEO of Norcal Lumber Company, Inc.
TCJ: What have you found helpful about the process with The Credit Junction? WW: It’s all about the reporting and having good information. It has also created a lot of discipline and accountability on my end. It has taken a lot of the anxiety out of the business. Starting a new business and being undercapitalized but knowing where we are going, the challenges and the anxiety that come along with that… having someone like The Credit Junction behind you that believes in your business and understands what you’re doing minimizes that anxiety. There’s enough going on that the last thing you need is to not have a good relationship with your credit facility. TCJ: Definitely. I’m sure being able to have conversations and get in touch with people when you need to. That’s one of the things I want to touch upon. When we first started, it was a $1M advance with a $5M line. How has that helped you to focus on your business versus wondering where your next availability would come from? WW: It gave me a tremendous comfort level that going out and taking more work was going to be okay. In this industry, with the commodity market as volatile as it is, there is a lot to keep track of. Knowing that I had The Credit Junction along side of me, and the credit facility that we had built in, gave me the confidence I needed to go out and execute and enter into some of the contract work that we were able to do. It has been a pretty good run. TCJ: Absolutely. Any final words? WW: Everybody that I have dealt with at The Credit Junction has been stand up. They have been very responsive, very open to solving needs that arise. As long as the communication is there and we are having these discussions in advance, it gives me a real comfort level and allows me to sleep at night a little better. I appreciate it!